The first musical I was ever involved with in any capacity was as a freshman in high school helping with the production of, “Fiddler on the Roof”. Since then the show has always held a very noteworthy region in my heart. Fiddler on The Roof was and is just about the most significant piece of musical theater ever. It’s themes and stories still remain relevant today and reflects that with the worlds ever growing refugee and immigration conflicts. A sequel to a musical is rare and often hasn’t worked. But unlike other musicals Fiddler leaves you with so many unanswered questions. Most musicals wrap everything up in a lovely fuzzy warm happy ending. Fiddlers ending is very despondent and truly leaves you worrying for the characters in a way one doesn’t with other shows throughout musical theater history. What”s going to happen to this family that’s about to be separated, possibly forever? This past Monday August 13th at 7 pm at the Minetta Lane Theater at 18 Minetta Lane in the heart of Greenwich Village I had the pleasure of getting some of those questions answered. I truly believe I was witnessing something important. Though originally I wasn’t really sure what to expect. 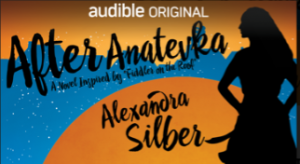 What I did understand was there was a novel involved called, “After Anatevka” written by Alexandra Silber, who most recently played Tzeitel in the revival of “Fiddler on the Roof” and also played Hodel in a London West End production before the revival. Making Alexandra somewhat of an expert on the characters held within the piece. “After Anatevka” is a sequel to “Fiddler On the Roof” and the evenings production was directed by Carolyn Cantor and produced along with Jeff Berger Management and Audibe. I first walked into the Minetta Lane Theater and on stage were a lonely piano stage right and mic and seat stage left with a copy of Alexandra’s book perched on a small table. Alexandra Silber entered introduced herself and her pianist, Ben Moss, who played handsomely and to perfection throughout the evening. Alexandra then began to read excerpts from her book, “After Anatevka” and following each excerpt up with songs reflecting the books story which were written by several different musicians and lyricists. In the story of, “After Anatevka”, second eldest daughter, Hodel, takes center stage as she tries to find her socialist leaning fiance, Perchik. She goes to the furthest reaches of the earth to a Siberian work camp to find him. Hodel and Perchik face many hurdles as they endure extreme adversity during one of the worlds most violent wars. The story is a stunning piece that not only helps answer questions musical theater fans have had for decades but also tells a great story of love and how far people are willing to go for that love. Making the night exceptionally special was having in attendance Fiddlers original lyricist, Sheldon Harnick, and some of the best that Broadway has to offer. Samantha Massell, Kerstin Anderson, Ellie Fishman and Matthew Scott who all sang seamlessly through the evenings production and did so with some serious soul and stregnth. One song that stood out was sung by Matthew Scott called “The Waiting World” with Music by Will Reynolds and Lyrics by Eric Price, which stood out as a particularly fierce piece that the whole audience felt. It was also great to hear a piece like “Dear Sweet Sewing Machine” sung by Alexandra and was one of the songs cut from the original production of “Fiddler On The Roof”. Alexandra said the song played only once in Detroit, which happens to be her home town. Coincidences like that make it seem like Kismet. If there was ever a show that deserved the opportunity to be made it’s this show. With decades of fans anybody who likes musical theater on any level should and would go see it. Kudos for Amazon and Audible for producing such an awesome evening. I truly hope I get to see it again as a full fledged musical and I look forward to reading the novel again. Alexandra Silber most recently starred as Guenevere in the highly acclaimed, record-breaking production of Camelot at Washington, DC’s Shakespeare Theatre Company. In 2016, she completed a run on Broadway as Tzeitel in the Tony-nominated revival of Fiddler of the Roof, co-starring alongside 6-time Tony Nominee Danny Burstein as Tevye. Following the run of Fiddler, Alexandra’s debut novel After Anatevka, a novel based on the hit musical (chronicling what happens to the characters of Hodel and Perchik), and her memoir White Hot Grief Parade were both published by Pegasus Books. On international concert stages, Alexandra has offered multiple solo cabarets in cities across the globe and was especially honored to be a part of Barbara Cook’s Spotlight Series at The Kennedy Center. Alexandra was nominated for a 2014 Grammy Award for her portrayal of Maria (opposite Cheyenne Jackson as Tony) with the San Francisco Symphony in a concert presentation of West Side Story. She will be playing Dina in Leonard Bernstein’s Trouble in Tahiti, opposite Shuler Hensley at Tanglewood in July of 2018. As a playwright, she has written modern language adaptations of three classic Greek tragedies through a commission by the Dutch Kills Theater.